Lahore: K-Electric and FIA officials met to discuss the campaign against electricity theft and ongoing Operation Burq. 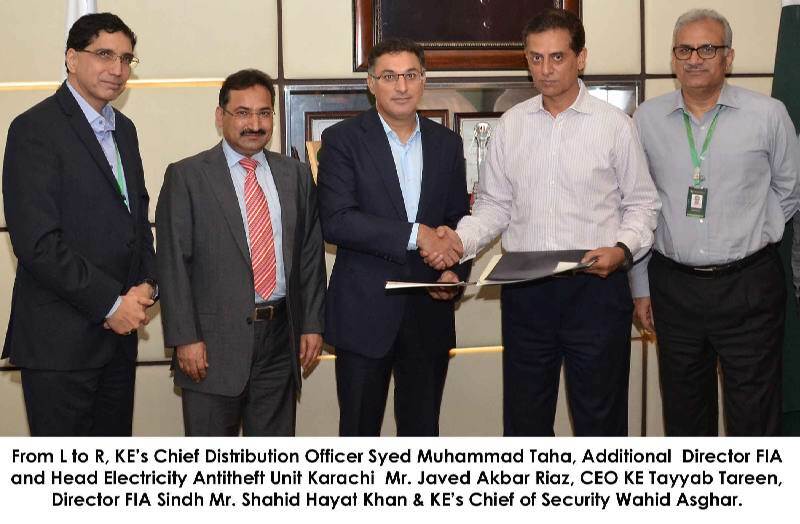 Director FIA Sindh Zone Mr. Shahid Hayat Khan, Additional Director FIA / Head EGOAU Karachi Mr. Javed Akbar Riaz, K-Electric’s CEO Mr. Tayyab Tareen, Chief Distribution Officer Syed Muhammad Taha and Chief of Security Wahid Asghar were present in the meeting. Details and progress related to electricity antitheft campaign (Operation Burq) in the light of directive of Prime Minister of Pakistan were discussed. Mr. Shahid Hayat Khan, Director FIA acknowledged and appreciated KE’s campaign against electricity defaulters and thieves across the city. He assured to cooperate and provide full support to KE after 15th of May in order to take stern action against the electricity thieves. The views were also shared about the benefits of this move initiated in accordance with the directives of the Prime Minister to curb the menace of electricity theft and adding Section 39 of the Electricity Act 1910 to FIA’s schedule of offences. KE’s CEO Tayyab Tareen said, “We appreciate FIA’s efforts as well because they seem committed to this cause with us. He added that KE offers an amnesty till 15th of this month and during this period defaulters and electricity thieves may take advantage and settle their dues and matter”. In the meeting, FIA and KE also shared a list of thieves against whom stern action would be taken once the “Amnesty Period” ends. The amount of such dues and losses was staggering and KE has committed to continue this operation with the help of FIA and Police without showing any disparity to the strong and powerful.